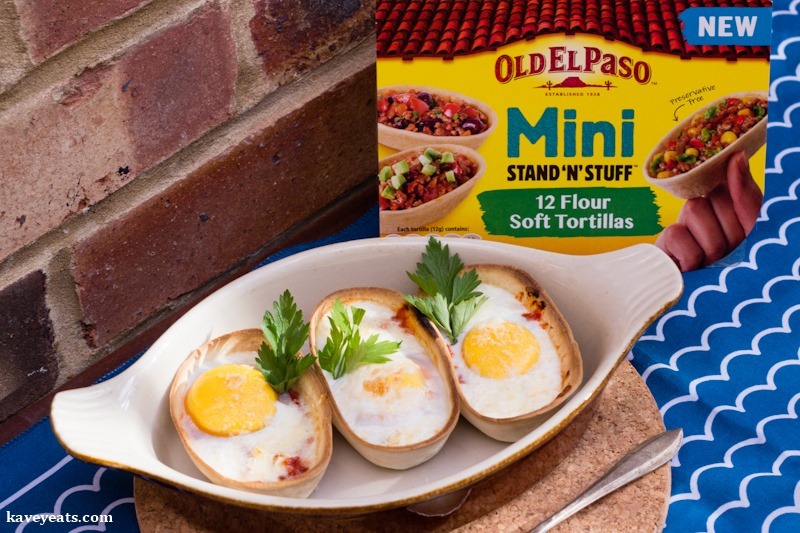 My first thought on seeing these new bite-size versions of Old El Paso’s Stand ‘N’ Stuff tortillas was to bake eggs in them, with a rich tomato sauce bubbling underneath. Given Old El Paso’s Mexican flavours, such an idea might put you in mind of huevos rancheros – fried eggs laid onto round corn tortillas and smothered in a fiery cooked salsa – but actually, my inspiration was shakshuka – eggs poached or baked in a spiced tomato sauce. This Middle Eastern dish is becoming really popular around the world, especially for breakfast and brunch. I decided to use a punchy chipotle paste to add a smoky chilli heat to the tomato and red pepper sauce, my little nod to huevos rancheros. My Shakshuka Boats are pretty quick to make – the sauce takes no more than ten minutes, assembly of the boats is very quick and the eggs take just 5-8 minutes under a medium grill. 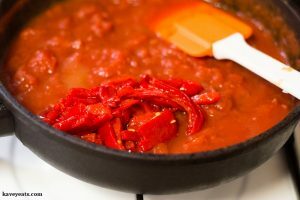 However, if you want to make it even quicker, substitute a jar of ready made chilli con carne sauce (that you would usually add to minced beef) or spiced tomato salsa and cook for a few minutes in a pan to thicken up a little. I tried this recipe with both quails eggs and hens eggs. Both worked very well so it’s completely up to how much egg to sauce you fancy! On balance, I preferred the large yolks of the hens eggs. 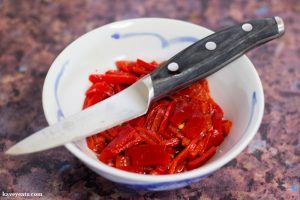 I bought a jar of roasted red piquillo peppers for this recipe but any roasted red peppers will do. If you can’t find chipotle paste, substitute one to two teaspoons of a spice mix such as fajita seasoning, cajun spice rub or chilli con carne seasoning. Alternatively, keep it simple with some sweet smoked paprika and a little chilli powder. If you can’t find quails eggs or small hens eggs, buy medium or large hens eggs. Before adding the eggs to the boats, break each one into a small bowl and scoop out one to two tablespoons (depending on whether the egg is medium or large) of the egg white, taking care not to break the yolk. Leftover egg whites can be used to make meringues or frozen to use later. If the red peppers are not already skinned, carefully peel or scrape the skin off, and then chop into small pieces. Place all the tomato and red pepper sauce ingredients into a large frying pan and cook over a medium heat, stirring regularly, until the sauce has thickened. This should take around 8-10 minutes, depending on your pan and the heat. Lower the grill tray so that it’s not right up under the elements, then preheat the grill on a low-to-medium setting. Lay the twelve tortilla boats out on a baking tray. Add about one tablespoon of the sauce to each one, spreading it out across the bottom. If using quails eggs you can use a touch more. 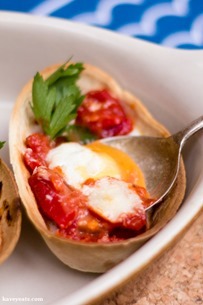 Break the eggs one at a time into a small bowl, remove excess egg white if necessary, and slip the egg gently over the tomato sauce in a tortilla boat. Repeat with all the eggs and boats. Top the eggs with a sprinkle of grated Parmesan and transfer to the grill. Grill until the egg whites are cooked, with no translucent areas remaining. This will take 5-8 minutes depending on whether you are using quails eggs or hens eggs, the heat of your grill and the distance between the grill element and the eggs. These cooking times result in cooked whites and soft yolks. Check regularly throughout the cooking time and give a little longer if needed. Garnish with parsley or coriander leaves, if using. Serve immediately. 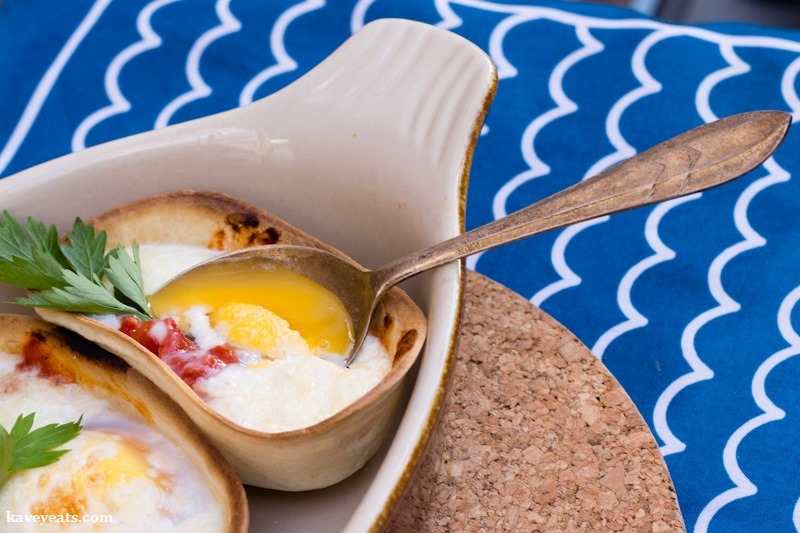 I hope you love these cute little shakshuka boats and are inspired to try your own. Here’s a Pinterest-friendly collage to save the recipe for later. 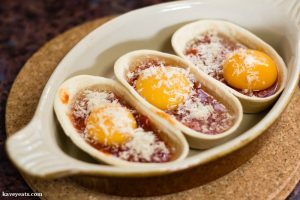 My shakshuka boats are perfect for breakfast and brunch or a light lunch or dinner and a great option when you need to cook eggs for several people at once; if you’ve ever tried doing twelve fried eggs at the same time, you’ll know what I mean! Kavey Eats was commissioned by Old El Paso for the development and publication of this recipe. Old El Paso Mini Stand ‘n’ Stuff Tortillas are available from major supermarkets (RRP £2.29). 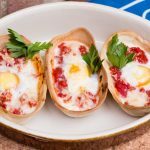 36 Comments to "Shakshuka Boats | Tomato & Red Pepper Baked Eggs in Tortilla Cups"
I do love shakshuka and love this Mexican twist to them. I always spice them up a bit too! The chipotle paste was perfect, it gave such a nice simple smoky heat that I decided not to add any further spices. I LOVE this recipe… those cups are a genius idea and I’m already plotting what I can cook in them. It’s also really kid-friendly so I reckon I’ll be rolling them out for after school teatimes come September. Yes, really easy for kids. I was thinking too that if you cut a curvey triangle of paper in the shape of a sail, they can sit at the table and make a sail (or two) and then when the boats are ready, you could use a cocktail stick to position their sails into their boats before serving. I don’t cook with young kids so I resisted doing this but I have to admit, it popped into my mind at the time! Thanks Renz, yes a much healthier after school snack than sweets and fried snacks but still filling and nutritious! We love making Shakshuka, as it’s a nice healthy and budget friendly meal. This is such a great way to serve it too. It’s very budget friendly isn’t it, and so quick. I like these boats as a way to add a little carbs to round off the dish and makes it a bit different too! This is a genius idea! I love those mini tortillas, perfect to really pile in the fillings, and as they are small you can have more than one! Thanks Helly, it’s was the idea that popped into my head immediately and I couldn’t contemplate any others as I was so fixated on it! These mini bowls are so cute!! It could be served for breakfast, lunch or dinner!! Yes I agree, it’s the kind of dish that works for any meal! 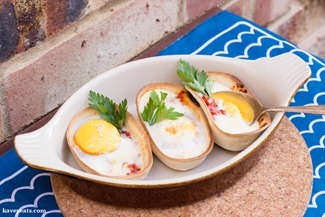 What a great twist on shakshuka it looks incredilble. ..and how fun that you have tried this with quail eggs. Thanks Dahn, yes thought it would be fun to try with the different eggs! These shakshuka boats are absolutely adorable! I’ve only had the larger stand n stuff tortillas (which we love) so I am definitely going to pick up these smaller ones. My kids will love them. The flavours in your shakshuka sound amazing as well! Thanks Kate, I kept the shakshuka really simple – but of course you could add onions, garlic and other finely diced veg if you like. I’m so glad you like the idea, hope your kids do too. I had this idea in my head for little boat sails the kids could cut out and colour in, then you could use a cocktail stick to prop them up in each boat! I have chipotle paste that I haven’t been sure what to do with – shakshuka boats it is! I love the smoky flavour and gentle heat of chipotle but didn’t want to faff chopping and soaking the dried chillis, so the paste was perfect. 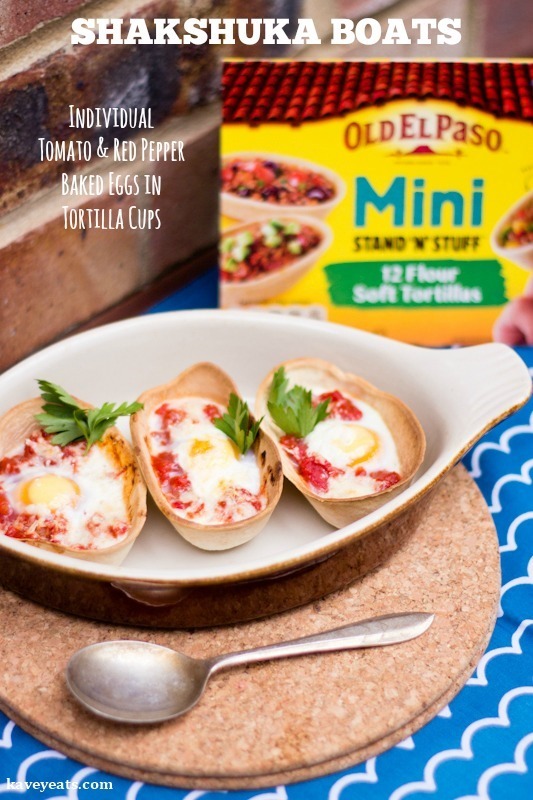 That’s a clever idea, making them in the cute little tortilla cups! Definitely the way to go feeding a crowd. Thanks Anne, yes it makes them easy to cook all at once when feeding a few at the same time! This is such a fun meal idea! Thanks Rebecca, glad you like it. What a great idea! I love egg dishes and I’m always looking for new recipes. Thanks! My pleasure, thanks for taking the time to comment. i picked them and then put them back, because already have a pack of tortillas in stock. I will definitely try them with some filling, perhapsa a cold tortilla filling like tuna or salmon salad, may be even fruit and cream. I will have to taste them first. 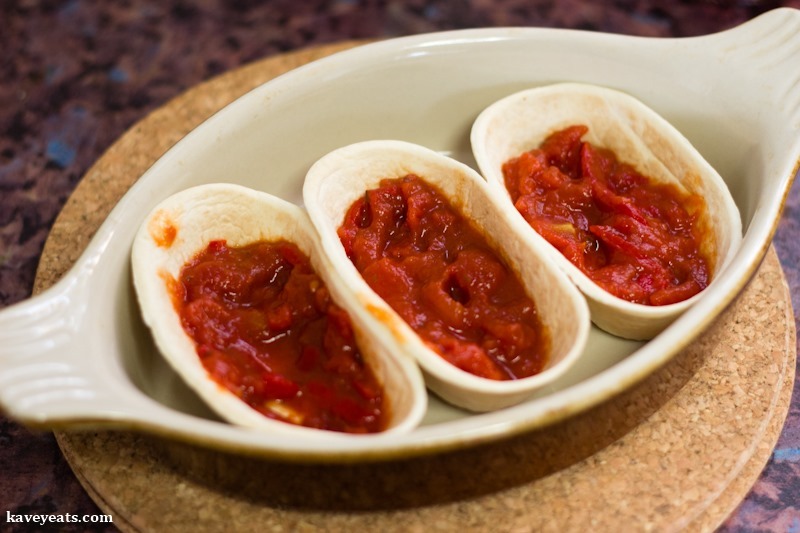 They taste exactly same as flat tortillas, but perfect shape to hold a filling. Tuna sweetcorn mayo would work well, or salmon salad! See, I am mad, mad, mad about shaksuka and mad about these mini tortillas. So these are perfect for me. I can’t wait to try them. Haaaa, they will suit you to the ground then, Bintu! Brilliant idea! 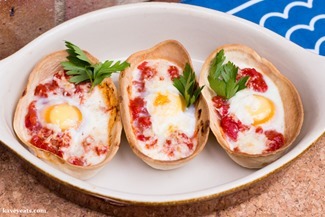 I love shakshuka, and these little individual cups are so cute. Perfect for serving at a brunch or something so everyone can help themselves. Thanks Becca, yes really good for when you need to feed more people as they’re quick and easy to make! Thank you! Only this year I’ve lost my Mexican food virginity. I know. Have never bought El Paso’s products before so it looks worth checking out. Haaa, wow! You’ve been waiting a while! Yes, do check out their range, I like their chilli con carne spice seasoning and the tortillas are always good. Thanks Camilla, hope they like! This is brilliant idea and I am just so mad that I hadn’t already thought of it. Can’t wait to give it a whirl – off to the shops to buy some ‘boats’ right now! Thanks Mary, hope you like them, we really enjoyed them!